Blooming tea combines the fragrance of tea leaves and slightly perceptible note of flowers used. Flower - rather to the visual component, rather than for flavor or aroma. Ingredients: amaranth flowers, white tea "Silver Needle". Eac.. Ingredients: Orange lily flower, osmanthus flower, white tea "Silver Ne.. 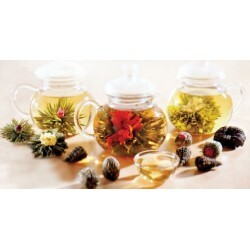 Ingredients: amaranth flowers, yellow chrysanthemums, white tea "Silver Needle". E.. Ingredients: jasmine flowers, Orange lily flower, osmanthus flowers, white tea&.. List of ingredients: needle green tea, jasmine, marigold, wood butterfly, lily, osmanthus, carnati..